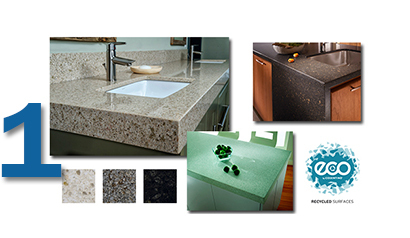 ECO by Cosentino countertops are made from 75% recycled materials such as mirror, glass, porcelain, earthenware and vitrified ash. Even 94% of the water used in its manufacturing process is re-used. Available in a wide range of colors, this sleek surface comes in two textures -- Polished (providing a brilliant shine) and Leather (for a matte finish). ECO also has an extremely low rate of water absorption and porosity, making it an ideal material for bathrooms and kitchens. Learn more about ECO by Cosentino. 5-piece solid wood doors made from Lyptus trees -- a hybrid tree derived from the eucalyptus species. They grow quickly and virtually every portion of the log is utilized. 3 contemporary door styles are available in environmentally responsible engineered exotic veneers. These veneers preserve rare and exotic trees for future generations by being plantation grown. 100% of the wood fibre is used. Plyboo solid bamboo doors for both the contemporary Newport and transitional Messina styles are available in natural lite or caramel finishes. A great wood for sustainability, bamboo’s growth rate can be as much as 6 inches up to 1 foot per day or 1.5 - 2.0 inches per hour.